History and art rolled into one big messy fabulous project. We're studying ancient history, so what better way to start off the year's art studies? 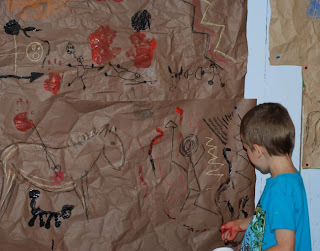 Cave painting has several advantages as an elementary-age art project: It's big. The materials are easy to find and to use. 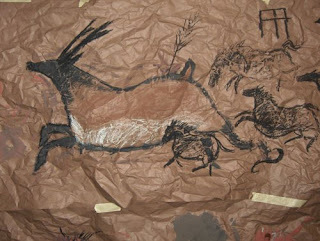 Cave paintings are very simple when it comes to subject and color. The pictures are not intimidating for children to imitate. You can fingerpaint or paint with sticks, draw with charcoals and pastels, or get even more creative and try to mix paints using dirt, leaves and spices. 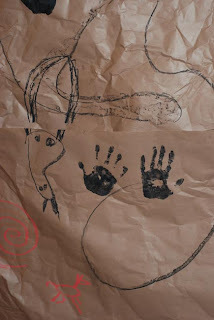 We studied cave painting as an art form. Look at cave paintings from aroud the world. Notice what makes them the same. What differences do you see? Why might people have painted these paintings? What did they paint? What do you think they used? Then do a warm-up drawing. Cut open a brown paper grocery bag. Crumple then flatten the bag. 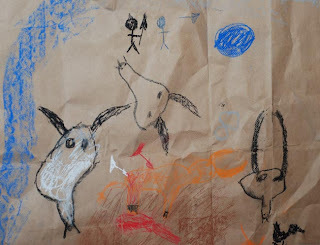 Draw your cave painting on the bag using charcoal and pastels. This step allows the children to experiment with the materials to find out what works and what doesn't, and to experiment with themes and lines and colors. Naturally, the fine young gents drew many weapons. Arrows, spears and blood were popular. If you've got the time, the materials and the space, create a wall-sized cave painting. Use large paper, the kind teachers put on their bulletin boards. Crumple it then flatten it to simulate the curves and rough texture of rock. 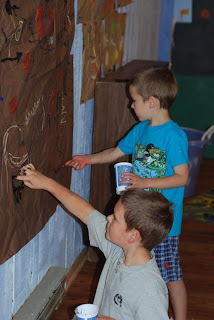 Attach the paper to the wall, put down a drop cloth if you're using paint, and let the children paint and draw their cave paintings using paints, pastels and charcoal, even dirt, sticks and leaves. Allow plenty of time for exploration of the materials and of the subject matter.